She's definitely got a new stylist. Stunning! Stephanie wears a beautiful dress and she looks great again! Diane, Beth, Coralie and ZL - where are you? I miss your comments! Thank you Masha. Very sweet. As I indicated on a post last week. I am done commenting here. I read. I just am no longer saying anything. Coralie, great that you have a lot going on lately! Diane, I'm so sorry you decided to stop writing your comments, you shure have your reasons (I can think for some of them) but maybe you'll change your mind and you'll come out in light again. I hope so. Wish you all the best! Masha, thank you again! But Diane, my friend, you must be kidding! We love reading your comments! I just grew weary of 'some' that seem intent on pushing us. Someone said not to be sensitive. I am not beoming sensitive here I am just not enjoying the negative jabs. Challenges to many of us. Plus it was taking me into pushing back. I did not like that about me. So I decided to say nothing. 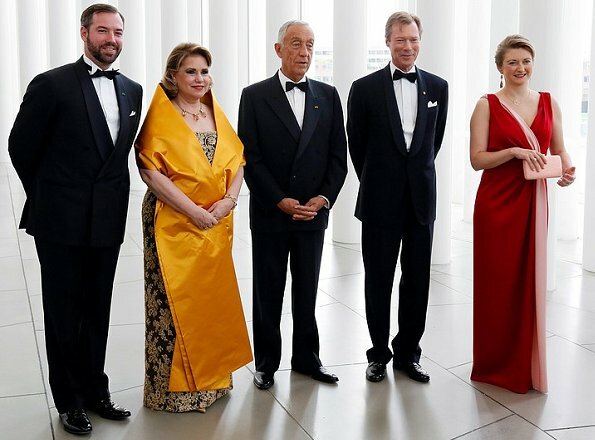 Would like to see the dress without the gold tablecloth around Grand Duchess Maria Teresa. Stephanie looks stunning! Love the dress, hair, makeup... everything. Stephanie's dress is nice but it will soon be ruined if she is not going to have it shortened. I feel sorry for the nice fabric. Same goes for MT, dress is too long. Look how they are wiping the floor with their gowns. The red dress has got the right length on the model. Maria Teresa should get rid of that awful yellow curtain asap. I agree that Stephanie´s dress is a tad too long, but I still like it better at floor length than the ankle length sported by the model. Encore sublime, Stéphanie ! 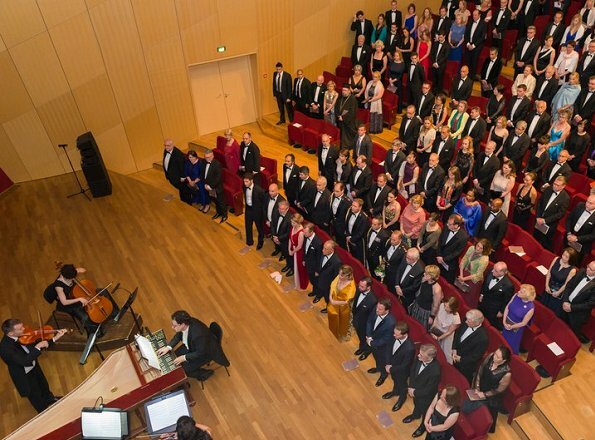 Bravo ! Stephanie looks lovely. Wow. Definitely a new stylist! Agree about Maria Theresa's strange shawl. That yellow thing is ugly. Stephanie is beautiful. lovely Stephanie.... im definately cheering you on! I agree. Stephanie looks very nice, but the grand duchess strange shawl is horrible. Stephanie has found a design partner who works for her--Paule Ka. It's wonderful to see this transformation! And it's not only sartorial--she seems so much happier and exudes more confidence. Splendide ! j'aime la robe, la marque et elle la porte très bien! c'est un bonheur. Quelqu'un d'avisé s'occupe d'elle c'est sur! Good job Stephanie. She definitely stands out. I think MT was self conscious about the dress; she generally likes those coat jackets so in lieu of one she must have really wanted to cover up somehow. Stephanie recently has found a style that works: feminine and colorful, and very flattering. She looks lovely! Stunning dress on Stephanie, bravo! Querida Mª Teresa, por favor, deja esa tela amarilla en el fondo del armario. Stephanie looks lovely again - a beautiful dress. 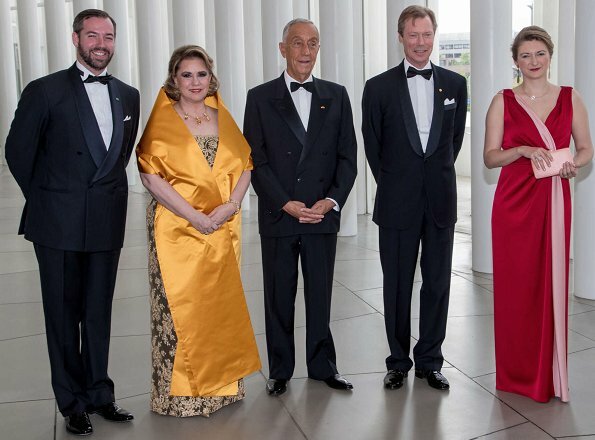 Maria Teresa - the dress underneath looks nice but what is that yellow contraption? zien er prachtig uit !!! Though Stephanie's dress is improving, this style looks very matronly on her. There is too much fabric on top making her look plump, I think. She would look better in something more fitted, not so "blousy." We've seen Stephanie in quite a few Paule Ka designs. She seems to have found a brand she's happy and comfortable in, and it shows ! 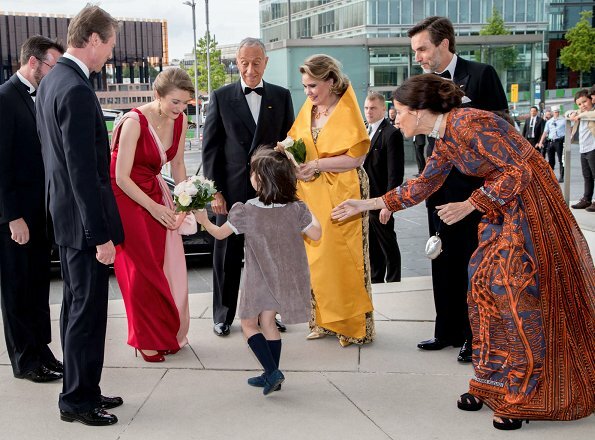 Grand Duchess looks stunning in the red dress. She is very beautiful, but mother in law looks ridiculous.